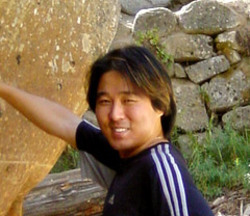 Tommy Yune has worked for over a decade in the comic book and video game industries. His early game development experience includes character design of the pioneering 3D fighting game FX Fighter for the Nintendo SuperFX chip and conceptual design of the award-winning Journeyman Project series. He also wrote and illustrated hit comic book titles such as Speed Racer, Racer X, Robotech, and Danger Girl: Kamikaze which were published by DC Comics' Wildstorm and Cliffhanger labels. His first work in feature animation was creating the computer-generated opening sequence of Kevin Altieri's Gen13. Tommy grew up on a steady diet of anime, watching as much Prince Planet, Gatchaman and Casshan as he could in Asia and the United States. Then he shunned television and went back to being a responsible student to the delight of his parents. However, right before entering the UCLA School of Engineering, Robotech brought anime back into his life and he eventually found himself at the ArtCenter College of Design instead. His parents wept. Tommy first worked in an official capacity for the Robotech universe by helping design Robotech.com for its launch in 2001. He has since come aboard as Harmony Gold's creative director and oversees new development, including Robotech: The Shadow Chronicles which completed production in 2006.